In all the years of working with Citrix products, I can assure you that one of the biggest thorns in my side has been related to client delivery. The process of getting a XENApp, or Access Gateway Client installed on an end users’ machine not knowing anything about the end users’ operating system was a subject that I would easily avoid if given the chance. Until Now... It’s no surprise that Microsoft wants to use this technology to deliver its own Application Streaming client. Citrix Receiver is a lightweight, auto-updating client that enables easy, secure access to applications and desktops from any device. Yes, any device! PCs, Macs, smartphones and thin clients. It provides a client framework, with a plug-in architecture that transparently controls the management of functional plug-ins, including updates and user notifications. The user experience is simple; the end user just visits the Citrix Receiver home page hosted in your corporate office, agree to the terms, download and install the receiver. Once the receiver is installed, an administrator can control all the available plug-ins that will be downloaded to that user. The Administration is provided by Citrix Merchandising Server, an easy to use virtual appliance that provides centralized management of plug-ins while also keeping them up to date. Since Merchandising Server is a virtual appliance, it’s easy to provision in any environment. Merchandising Server also includes tools for migrating existing Citrix customers from legacy implementations of Citrix software clients such as Citrix Program Neighborhood, PN Agent, and Web Interface. XenApp, XenDesktop, CitrixAccess Gateway and Branch Repeater plugins are all available to the Citrix Receiver right now. 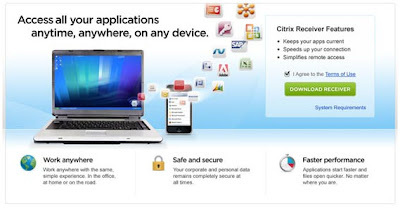 Citrix Receiver is free and is available for any Windows-based device, including PCs, laptops, netbooks and even thin clients. Citrix Receiver forApple`s iPhone is also available as a free download from the AppleApp Store. Citrix Merchandising Server is also available free charge. If you've experienced the pain like I have, it's worth your time to take a look. You will be glad you did.